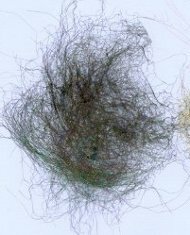 I have recently started to make Dicrofiber Scrapbook Embellishments for my scrapbook layouts and for cards after I recently ran into a web site that sells an item called DicroFibers ™. These Fibers are Diaphanous (Light, delicate, and translucent) floating threads that resemble dichroic glass, like you find in jewelry designs. These fibers fuse in seconds with a medium hot iron to make a very lacy "fabric". Dichronic Glass or dichroic material is one which causes visible light to be split up into distinct beams of different wave lengths or colors. All that being said, these fibers are really amazing. I recently made some card fronts with these and some other supplies I obtained from US Art Quest.com. The DicroFibers ™ themselves are hairlike fibers that are both light reflective and light refractive and have an iridescent look. These fibers are fusible when exposed to a hot iron. First of all, the fibers that I purchased came in an nice little kit in a tin box with 12 colors of the Dicro Fibers™ named Periwinkle Blue, Wisteria Purple, Sunflower Yellow, Pink Carnation, Red Rose, Lilac, Lilly, Fern, Copper Leaf, Silverbells, Daffodil and Leaf Green and are shown above. USArtquest recently came out with 6 new colors to the Dicrofibers and while I don't have them yet, the new colors are called Coral Bells, Blue Iris, Evergreen, Poinsettia, Pinks and Bark. These luscious colors will add some real sparkle to your pages. The set of 6 colors sells for $14.99 or you can purchase each color for $5.29. I do have the bark and it is a perfect coppery brown. Included in the original kit was a tiny 2 oz, bag of Mica chips or what they call Fusible Opal Chips. These can be sandwiched in between layers of the Dicrofibers for an interesting effect. 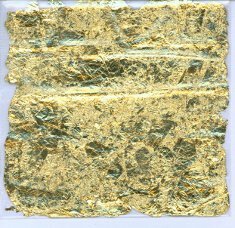 Also included in the kit was a tiny bag of Gildenglitz in Gold color (looks like what I have used for Gold Leafing). Like the Mica Chips, the Gildenglitz can also be sandwiched in between the fibers. I have used this Dicrofiber Tutorial as the basis for all these card fronts and for DicroFiber Scrapbook Embellishments, is pull a few fibers from the bunch and place them on a piece of Parchment paper included in the kit. I folded the parchment over the fibers to sandwich them between the parchment and pressed with an iron on Silk setting for about 2 seconds. The heat will cause the fibers to fuse together and make a very light and airy fabric. Unfortunately, what you can't see in the photo is the iridescent color changes that just don't show in a still photo. The longer the iron is on the fibers, the more brittle they seem to become and the darker they seem to get. They can scorch, and the supplier says that scorching can cause interesting effects. I tried to scorch mine on purpose to see what they looked like. Mine seemed to turn darker with less color definition. I like them and used them on some of my cards. 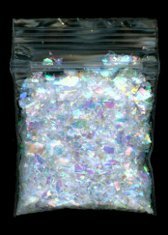 As I mentioned earlier, a small bag of Mica or Fusible Opal Chips also came in the kit. I used some of the mica chips in these cards below. I placed a few of the Dicro Fibers™ on the parchment, then sprinkled on a few of the Mica Chips or fusible Opal Chips and then placed a few more of the Dicro Fibers™ on top. Then I folded the Parchment Paper over the sandwich and pressed just 2 seconds or so, and the fibers fused to one another and have captured the Chips in between. This makes for a little thicker and more substantial DicroFiber Scrapbook Embellishment fabric which is less see through, but the Opal Chips certainly add sparkle. Other Supplies: The Starfish Stamp used here was the Club Scrap collection Castaway Wood Mounted stamp released in February 2010. The cards with the Pink Paper was from the Club Scrap kit called Jubliee from Jan 2010 and Green and White cards came from the Castaway Kit from February 2010. 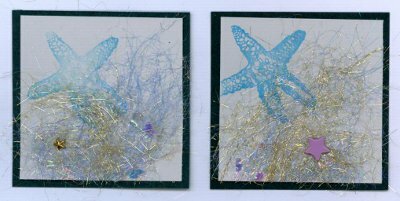 The Starfish, Conch Shell, Gold Stars, Star Brads and Flip Flop brads all came from the Eyelet Outlet and actually help to attach the Dicrofiber Scrapbook Embellishments to the cards or pages. Just like using the Opal Chips above, the Gildenglitz can be used the same way, but it is much easier to see in the photos. Place a few of the fibers on the parchment paper, then a few of the Gildenglitz pieces, them more of the Dicrofibers and the parchment paper on top. Press for two seconds and the effect is just stunning for an elegant Dicrofiber Scrapbook Embellishment. In these examples above, I took a Rubber Stamp (do not do this with acrylic stamps), inked it with Black Staz-On Ink and placed the stamp with the rubber side facing up. Then I placed some of the Dicro Fibers™ on the top of the stamp, then the Parchment Paper, then the iron for about 2 seconds. After the iron, the fibers will need to be pulled gently from the stamp and the inked image will appear on the back of the “fabric”. The reverse side of the fibers shows the stamped image best in these Dicrofiber Scrapbook Embellishments. This won't work as well using stamps with words. Other Supplies Used: The stamp used here was from the Club Scrap collection Tuscany Remix of unmounted stamps released in early 2010. The card with the Pink Paper was from the Club Scrap kit called Jubliee from Jan 2010 and the other cards of Green and White came from the Castaway Kit from February 2010. The little bird brads came from the Eyelet Outlet and are actually holding the Dicrofiber Scrapbook Embellishment to the card itself. It took only a few minutes to make these cards - the process of making the fiber “fabric” went very quickly. 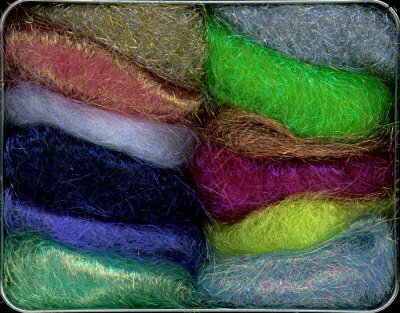 I hope you will give these Dicro Fibers™ a try - they were a lot of fun, produce dramatic results with very little difficulty. And they look like you spent hours on them. to purchase these great products. Go back to our Scrapbook Tutorials for other interesting processes. Check out other Scrapbook Embellishmentsfor more great ideas.